Drain your chicken and shred with two forks. Mix together your shredded chicken and your soup in your crock pot. Taste the mixture and add salt and pepper to your taste. If you added salt and pepper, stir everything together until it is well blended. 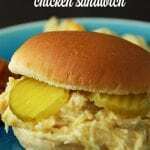 Spoon your chicken mixture onto your favorite bun and add some pickle slices if you please!